Whenever my extended family gets together, we always find ourselves in hilarious fits of laughter brought on by telling embarrassing stories of everyone’s past. The time my dad had to take a run into the woods on the way home from Thanksgiving dinner after consuming too much mince pie... The time my dad continued a drawn out conversation with a neighbor even though he had stabbed his foot with a pitchfork but was too embarrassed to let the neighbor know... The time my dad fell into my Aunt Ginny’s grave after torrential rain had softened the grave site... Okay, we mostly laugh about my dad! Recently, I came up with a game that is a tremendous aid in our pursuit of embarrassing each other. A more well-meaning person might describe this game as a way to celebrate family and remember why we love eachother. It's a twist on the always-fun, Guess Who! 1. 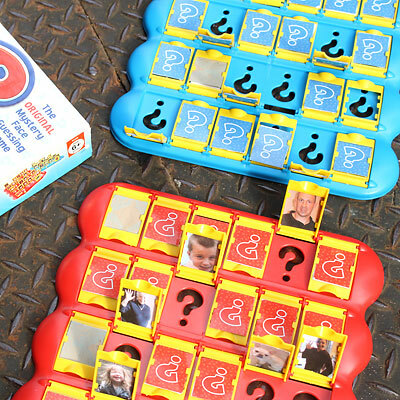 PURCHASE the original Guess Who memory game. 2. PRINT out pictures of your family's faces. Remember to think about the size of the Guess Who cards and to make sure that your photos are small enough to cover the faces of the characters on the cards. (If you are using a Mac computer, the easiest way to do this is to print out the photos in the contact sheet format. 3. PRINT another copy of each person’s face so you have two of each. 4. 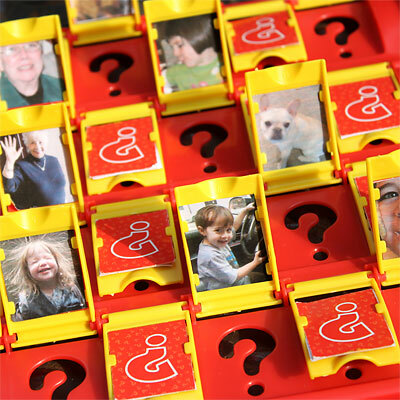 GLUE your family photos over the cartoon faces from the original game to make it your own. • “Does this person do a mean rendition of Miley Cyrus’ Party In The USA?" Have you ever done something similar with another old board game? Please share ideas below! We're always looking for fun new twists on old favorites. Play Pretend Spa with your kids. Spa treatments are a family tradition that had me and my sisters giving our mom anything from a back massage to mani-pedi treatments. Now it’s my kids turn to walk all over my back with socks on, katate chop my legs and “hula girl dance” on my bottom. We also do hair salon day and I get “fancy going out” styles that I thankfully don’t have to wear outside. Great article and I love this site! So fun!! will have to try this, our family LOVES this game. my youngest cracks me up every time when she asks “does your guy have facial hair?” with family member photos it would be hilarious!